InLoox PM 8 provides you with rapid and comfortable assignment of e-mails to the project document storage. If you have already added the e-mail, you see its link. Please follow these steps to record existing and new emails. Open an email from your personal Outlook inbox (or any other folder) by double-clicking it. 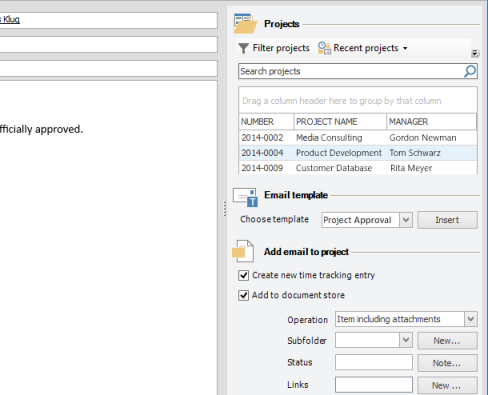 Select a project from the quick access panel on the right side next to the email. Use the filter to search for the project. For more information, see Search and find projects, in the Use filters section. Click Clear selection , if you want to remove the selection. By clicking OK, the New Item dialog box will be displayed. Fill out this dialog box with the required information. For more information, see Create and edit a time tracking item. Activate the Add to document store control box. With this option, you can assign any email attachments (files) to a project. For more information about management methods, see Add Outlook elements to InLoox PM, in the Management methods area. In the Create a New Subfolder dialog box select the directory in which you want to create a new folder. Click Create New Folder and enter a new name. Click Links to link the Outlook element with project elements. Click New on the left to the Links field. In the Assign Document Relation box select between mindmap nodes, work packages, time tracking items and paning elements. Add and then OK.
How to add emails to the quick access panel in InLoox PM 8 • Copyright 1999-2019 © InLoox, Inc. All rights reserved.